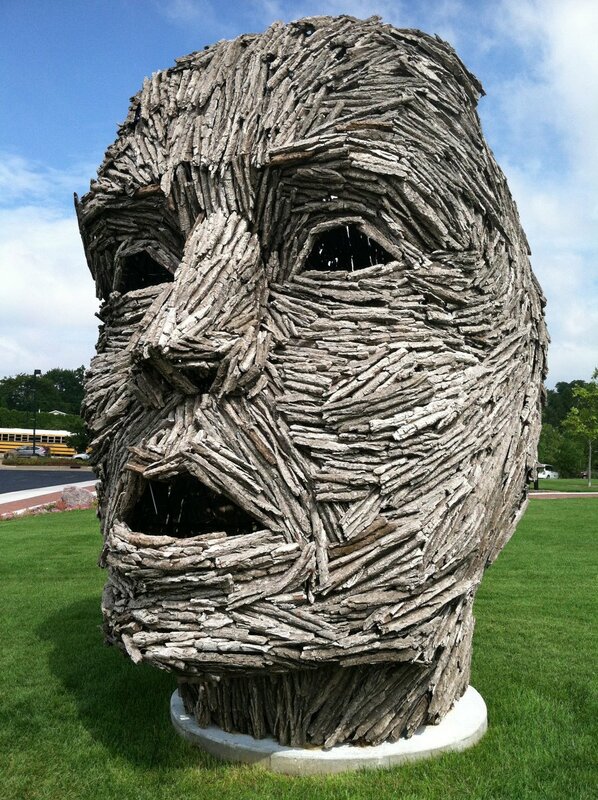 Just north of the corner of 18th Street and Middle Road in Bettendorf is – strangely – a large head made of bark in an open field. More than 13 feet tall, it’s hard to miss. 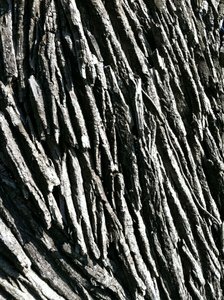 What makes the sculpture feel truly immense, however, is how the artist has fulfilled her goal of “giving the Earth a voice” through this work. The artwork’s title, Exhaling Dissolution, refers to the pollution constantly being spewed into the environment. Inspired by Deppe’s research into deforestation, the artwork took four months to plan and construct. 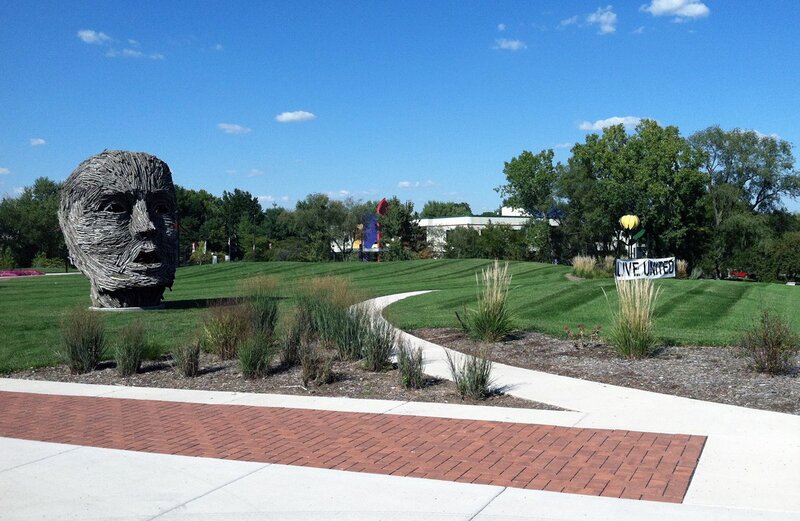 Since its completion in 2010, it has been displayed on the Northern Iowa University campus and along the Riverwalk in the Port of Dubuque before being installed in Bettendorf on June 29, 2012. The artwork will be displayed in Faye’s Field for only one year – through June 2013. The field is the most recent addition to the 13-acre Learning Campus that also includes the Family Museum and Bettendorf Public Library. The park-like space is named in honor of Faye Clow, who served as the director of the city’s library for 30 years and died last year. Faye’s Field is designed to keep rainfall on the site and reduce the amount of storm water entering the sewer system. Among its winding walkways, rain garden, perennial plants, colorful flowers, and native grasses are other sculptures – including a delightful bronze sculpture of a child seated on a bench reading an illustrated book; a sheet-metal sculpture of two sunflowers created by Scott Community College students in the welding and automotive programs; and a metal sculpture of cattails by Mitch Brown. The goal of Faye’s Field as an outdoor learning environment is fully in concert with the ecological message of Exhaling Dissolution. Yet the sculpture strikes a very different mood from its amiable surroundings. The sculpture’s empty eyes are like the eyes of a mask. From its open mouth, one can imagine its lungs, as if the visible sculpture were part of a full figure with its head rising temporarily above the ground. One almost waits for its inhalation, like a swimmer’s gasp for air after breaking the water’s surface. Exhaling Dissolution is an avatar – a form given to an intangible presence. Its mysterious, sphinx-like quality leaves something untold for us to dwell on. The artist’s intention was to give the Earth a voice; she never said what that voice would sound like. This article was originally featured on the River City Reader on September 18, 2012.